The burst of cells forming cartilage is associated with mineralization during the early stages of bone formation, and nanofragments of the cell membranes can act as nucleation sites for amorphous calcium phosphate, as reported in two studies just published in Integrative Biology and ASC Biomaterials Science and Engineering. Understanding of biological phenomena (Life Science) from a multidisciplinary approach enables the development and optimization of bioinspired materials (Bioinspired Engineering). Cartilage has a very important scaffold-like function for the development of bones; during endochondral ossification, the chondrocytes, the cells forming cartilage, secrete matrix proteins and mineralization factors that optimize the environment for mineralization. The mechanisms of bone formation are not completely elucidated, and manipulating mineralization is challenging yet. Gaining control on this process is relevant as it would result in improved bioengineering techniques for cartilage tissue synthesis and reconstruction, and for the control of bone formation. To gain further understanding in the initial steps of mineral formation, Professor Takuya Matsumoto and Assistant Professor Emilio Satoshi Hara from the Okayama University Graduate School of Medicine, Dentistry and Pharmaceutical Sciences studied bone formation in the femur epiphysis (that is, the rounded end of the bone) in mice during secondary ossification in the first post-natal days. In a first study, the researchers observed that chondrocytes burst near the mineralized area, which they suggest might be a space-making mechanism for mineral expansion. The space created after the cell burst indeed matches well that later occupied by the minerals at the end of the process, as demonstrated by time-lapse images of the initial bone formation process. To demonstrate the link between the burst and mineral formation and expansion, Professor Matsumoto and colleagues used external stimuli to induce the burst and manipulate bone tissue formation. In particular, two external factors were linked with triggering the burst: mechanical and osmotic pressure. Indeed, ex-vivo culture of the femur epiphysis in hypotonic condition or under mechanical pressure enhanced mineral formation, and in-vivo investigations of the role of mechanical pressure showed that reduced pressure onto the joints results in suppressed bone formation in the femur epiphysis. In the research presented in the second paper, the scientists used a variety of techniques to observe the dynamic changes in organic and inorganic material in the cartilage in a time- and stage-specific way, confirming that the early steps of mineralization are based on the activity of chondrocytes. A careful analysis of nanofragments observed near the mineralized area revealed that they were nanofragments of chondrocyte membrane, and could be the nucleation sites for amorphous calcium phosphate, which then transformed into apatite crystals. The phospholipids in the fragments could provide the phosphate needed for this process. 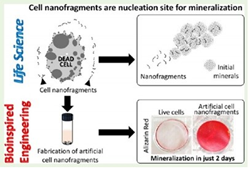 The researchers also synthesized artificial cell nanofragments, and showed that they promote mineral formation in vitro. Controlling chondrocyte burst by means of external stimuli could result in new approaches to cartilage and bone tissue engineering. Moreover, because cell membrane nanofragments provide nucleation sites for mineral formation, these could be used to manipulate biomineralization, as the authors comment: “manipulation of chondrocyte burst with external mechano-chemical stimuli could be an additional approach for cartilage and bone tissue engineering,” and “in the future, cell membrane fragment-based materials can also be developed and applied in bone tissue engineering and regeneration”. There are two types of ossification centers, primary and secondary. Primary ossification center appears during prenatal development, whereas secondary ossification center appears during the post-natal and adolescent years. In long bones, the primary ossification center occurs in the central part of the bone, the secondary ossification center in the ends. Two processes result in the formation of bone tissue: in intramembranous ossification, bone is laid down directly into the primitive connective tissue. In endochondral ossification, the one studied in the research discussed here, cartilage acts as a precursor, and is progressively degraded and replaced by bone. Because this research reveals two ways to induce the burst of chondrocytes (which in turns control bone formation by making space for mineralized tissue), by using mechanical and osmotic pressure, it opens the way to new methods to engineer bone tissue. The unveiling of the role of membrane fragments as nucleation centers for bone formation provides a new avenue for the development of biomaterials for bone tissue engineering and regeneration. Both results open new opportunities for bioengineering of bone tissue. Emilio Satoshi Hara, Masahiro Okada, Noriyuki Nagaoka, Takako Hattori, Takuo Kuboki, Takayoshi Nakano, Takuya Matsumoto. Bioinspired mineralization using chondrocyte membrane nanofragments. ACS Biomaterials Science & Engineering, January 16, 2018. Emilio Satoshi Hara, Masahiro Okada, Noriyuki Nagaoka, Takako Hattori, Takuo Kuboki, Takayoshi Nakano, Takuya Matsumoto. Chondrocyte burst promotes space for mineral expansion. Integrative Biology, 2018,10, 57-66.